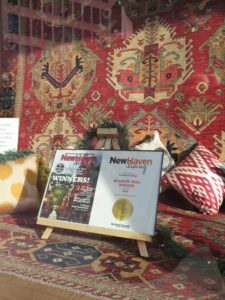 Kebabian’s is very proud to have been voted the winner in the category “Best Rugs” in the Best of New Haven Living 2016 Reader’s Poll. The result is a great encouragement to us, and we send our thanks and appreciation to everyone who voted. Kebabian’s is blessed to have so many customers, friends and allies. We hope that we’ll continue to steward the business well in the years ahead! In other awesome news, we are very excited to present you our new website! The team at Driven Local – Joe, Robin and Shannon, have done an excellent job and we are very proud of them. It will take us some time to get inventory up on the website, but we’re going to go as fast as we can. Happy viewing!